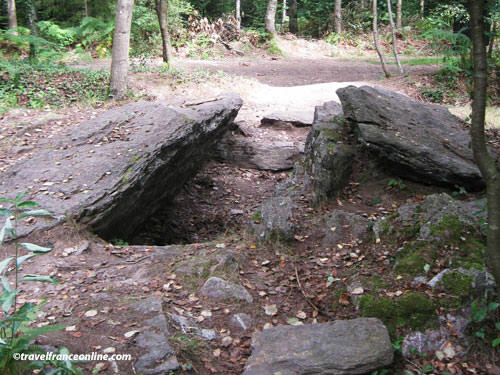 The Tombeau des Geants is located in the Forêt de Brocéliande, a stone's throw from the Hostié de Viviane. You can access it from the same parking lot, near the hamlet of La Touche Guérin. Bronze Age men erected this burial chamber around 1500BC. 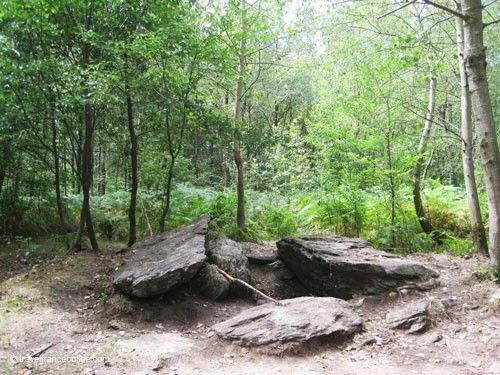 However, they didn't look for new boulders, but re-used four megaliths (menhirs or standing stones) erected on the site during the Neolithic. They then covered this huge single burial chamber with a tumulus or cairn. Its impressive dimensions (4m x 1m x 1m) led locals folks to name it the Tombeau des Geants - Geants' Tomb. However, they also call it La Roche à la Vieille. Excavations led in 1982 uncovered very few artifacts, apart from pottery fragments and a single flint blade fragment! This absence of artifacts is sadly due by the fact that in the past treasure hunters looted most megalithic sites. Therefore, all that is left of the Tombeau des Geants are the two side walls and the cover stone. The 4th menhir they dislodged is now lying 8m away from the burial chamber. This ancient site has of course given rise to more legends! 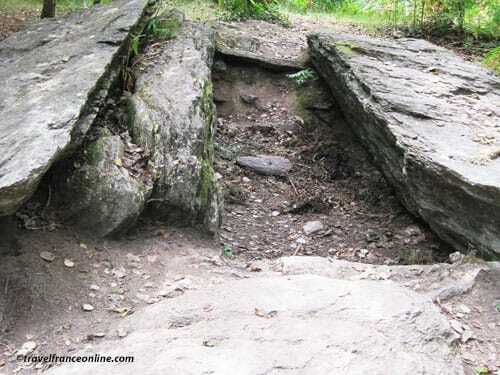 According to the first legend, Le Tombeau des Geants would be the grave of a giant King's Arthur Knights had killed. However, a second legend tells that the funeral chamber was once the grave of a giant breed of men. However, the most accepted explanation is that the Tombeau des Geants is actually the individual burial place of a local chieftain. That would make sense, wouldn't it! ?